Yes, Silect did it again! 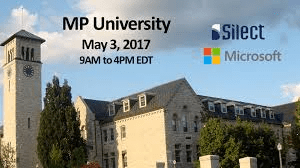 Few days ago Silect Software provided MP University 2017, an online event packed with sessions from well known names like Kevin Holman, Brian Wren and Aditya Goda from Microsoft, Marnix Wolf from Didacticum and Mike Sargent from Silect. What I like about this event is, that it is not marketing instead the sessions are packed with very deep content of MP authoring and as it seems to start touching OMS as well . If you missed this event I encourage you to watch the recordings online on Youtube. Thanks to all the great presenters for their commitment.